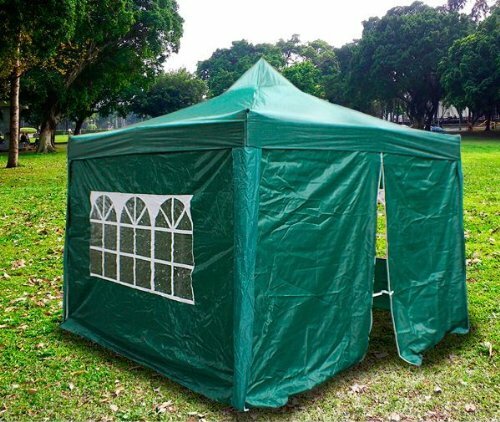 After the Kingpin's last gazebo canopy list made the rounds, a bunch of you wrote in and asked for more information on portable pop up gazebos for sale online. It seems as a lot of you are on the move and a portable gazebo canopy option would do you well! Last update on 2019-04-26 at 06:58 Product prices and availability are accurate as of the date/time indicated and are subject to change. Any price and availability information displayed on [relevant Amazon Site(s), as applicable] at the time of purchase will apply to the purchase of this product. BONUS: Bottom of the Barrel Pop Up Gazebos!!! 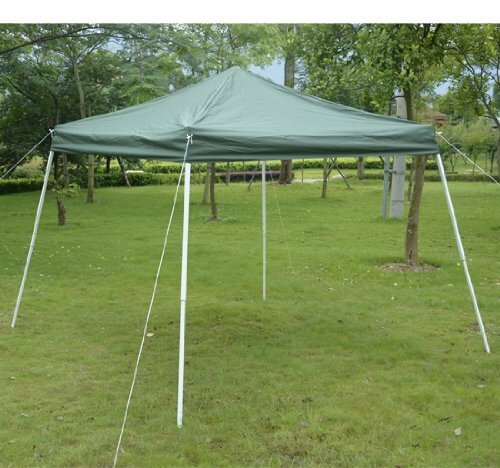 Hence, the Kingpin has decided to bless you all with another EPIC canopy list: 11 Great Pop Up Gazebos For Sale on Amazon. As always, the Kingpin has scoured the deepest pits of the giant online outlet in the hopes of finding only the best pop up gazebos available. On to the good stuff! Sit back and relax with a good cup of Joe and take a moment to browse through this awesome pop up gazebo collection. Any of you remember this badboy? The Kingpin featured this awesome Coleman pop up quite some time ago and it's not surprising that it has become one of the most popular instant canopy models on Amazon. It's just right for your backyard and lights up all on it's own with the featured LED lighting system. This gives you the perfect place to entertain your guests on a cool summer evening. It's so easy to setup you can have your teenagers do it. 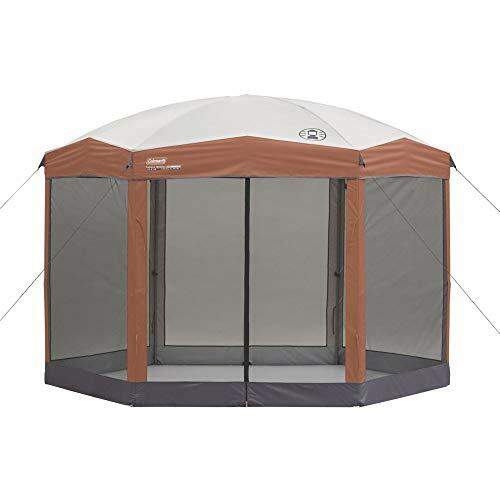 If you're looking for a pop up gazebo, this is an awesome portable option that has plenty of positive feedback in the review section and takes care of the outdoor lighting for you. What else could you ask for? 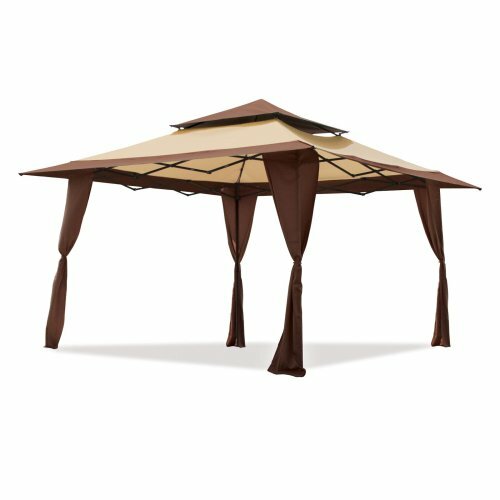 This 10 x 10 pop up gazebo is perfect for all of you looking for something on the cheap. No frills or gimmicks--just plain and simple ﻿pop up gazebo portability in a super affordable package. Sure, it may not be easy on the eyes, but if you just need something reliable to set up and down quickly and carry off to the next event center, this pop up gazebo from Prosource will certainly do the job. It's sturdy steel tubing frame sets up in seconds and will have you ready to take on your next farmer's market--hassle-free. Check this one out if you're looking for something reliable that won't break the bank. 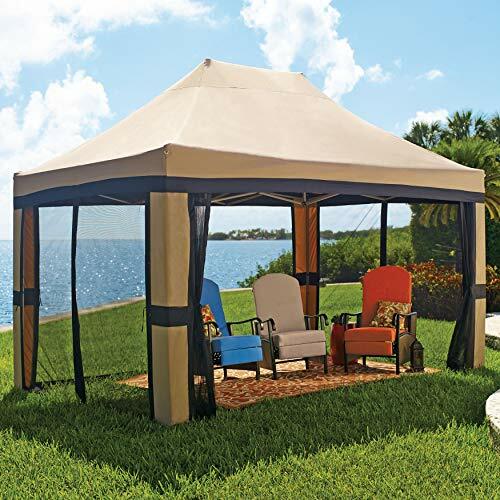 This offering from E-Z Up also made it to the Kingpin's last gazebo list but is still very highly-rated by customers and also deserves a spot on this list. Made from both water and fire resistant 250-denier polyester, this pop up gazebo doesn't sacrifice aesthetics for portability whatsoever. With the stunning two-tone canopy top and matching leg skirts, it will be a great addition to that upcoming picnic or your next family trip to the lake. This pop up gazebo from Brylanehome is easily one of the prettier ones on this list. The 10' x 15' shaded area provides plenty of coverage and the nylon netting ties up neatly to the sturdy steel frame when it's not protecting you from insects. No tools are necessary to set it up and at this size this pop up will literally extend your patio out into the rest of your backyard if you want it to. Not enough coverage for all that lawn furniture at home? Not anymore. A pop up gazebo this big is a perfect fit for outdoor parties or reunions of all types and it comes with a wheeled carry bag for maximum mobility. So, if you're looking for a little bit more space than usual, this may be the one for you! Are you looking for portable gazebo coverage for your local flea market or trade show? If so, Quictent has a great offering and it also includes a carry bag and four sidewalls to boot. Made from power-coated rust resistant steel, the frame on this thing is rock solid. All the joints are welded steel connected with heavy-duty commercial grade fittings. This will give you plenty of shade even in relatively windier areas, like a company outing at by the beach or something like that. The sidewalls are all made of polyester fabric (fully-equipped with zippers, of course) and easily attach to the steel frame legs via convenient Velcro straps. All four corners come with additional patching for extra reinforcement. 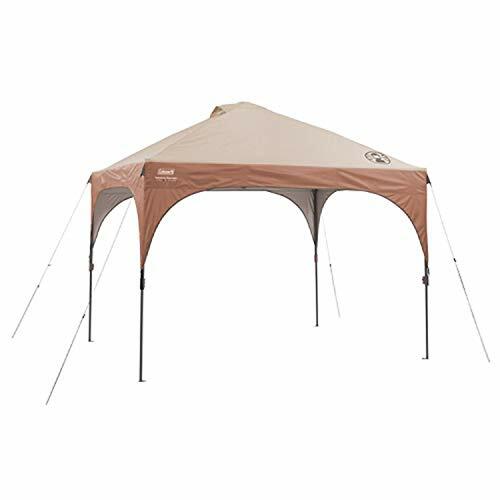 Quictent portable pop up gazebos are a great deal. Not only are they waterproof and UV protected, they are specially-coated to resist mildew and other build-up as well. There are no loose parts whatsoever and no tools are necessary to set these bad boys up. Super reliable, no-nonsense and as portable as a pop up gazebo can get! Our next is great for camping. The removable, zipper-equipped net panels give you adjustable protection against bugs and insects and the stylish trapezoid-like shape will look great by your brand new camper. The top measures in at 8' x 8' and then streams down to a larger base, measuring in at 10' x 10'. Everything is supported with a metal frame and durable plastic connectors. This may not seem as reliable as some of the other models we've featured on this list but you are sacrificing some durability for lightweight convenience. It also comes with a carry bag and has no loose parts so you can still expect to set it up in seconds. TAKE NOTE: this peculiar design may be attractive to the eye but the basic concept of rain falling STRAIGHT DOWN from the heavens (and right through the insect mesh) may worry some of you. Sure enough, the comments and reviews for this model are riddled with complaints about rain coverage and, surprisingly enough, even a lack of canopy waterproofing! Maybe the manufacturers had something else in mind? Like a pop up gazebo... mosquito net, perhaps? Whatever the case, if your looking for something to keep you dry in the rain, look at some of the other models instead. Outsunny has a similar offering that gives you the same open air "feel" of no walls but without all the nasty insects. The frame is made with sturdy rust resistant steel and you get the same zip-up mesh features without the trapezoidal design. Everything fastens nicely into place with Velcro straps and this also comes with its own carry bag. and will be perfect for any outing or outdoor occasion you may have coming up. This pop up gazebo from Coleman was actually one of the first products the Kingpin ever featured! Coleman has packed 120 square feet of coverage in this beautiful instant screened shelter and the hexagon design gives you all that extra space around the corners. It sets up easily in less than three minutes and you can remove the screen walls if you need a little more breathing room. This is certainly one of the Kingpin's personal favorites. One thing to point out: The Kingpin still wishes this pop up gazebo came with all the gorgeous blonde daughters right out of the box... in a perfect world, maybe. OK, sometimes less is more and this no-nonsense offering from Palm Springs may be just that. The buy-in is extremely practical, especially considering that you're still getting a full 10' x 10' of coverage. It comes with most of the bells and whistles like quick 5 minutes setup, its own carry bag, and rust resistant steel framing. 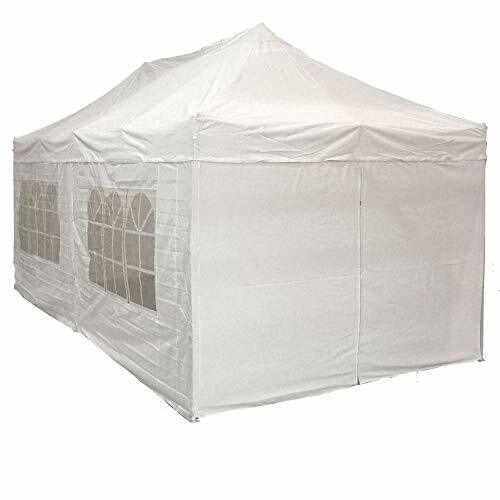 It may not have insect screen walls or zip-ups but it provides shade with 500 denier heavy duty polyester, which is almost double of some of the other pop up gazebos on this list. It seems that this thing plays to its strengths! If you're looking for something at a great price point but doesn't scrimp on the necessities, this may be a good option for you. Click through and check out some of the reviews for yourself. IMPORTANT NOTE: It also sets up quite easily on HARD surfaces, like cement driveways or parking lots. Awesome news for all you city-dwellers out there, I'm sure. A little color never hurt anyone! MTN Gearsmith brings you pop up gazebo goodness in a rich, dark green and the 10' x 10' coverage is legit. This model comes with a wheeled portable carry case and features PVC coated water resistant coverage for all your outdoor needs. The sturdy steel frame supports the polyester canopy and sidewalls and even provides white trimming on the view window to pretty things up. The Kingpin wishes there were some better product photos available but this is still a steal so it was included on the list. Our last model is actually only here because it is technically a pop up gazebo but in reality this monster could have made it onto the Kingpin's post on party tents from a few weeks back. This huge six-wall gazebo is one of the biggest portable pop ups money can buy! It offers a staggering 10' x 20' of quality coverage and comes with a heavy duty steel frame and base, as well as durable nylon fittings at the joints. This pop up gazebo is simply huge. If you can extend the budget a little bit, don't hesitate to cash in on this great value. One of the main problems many people have with products featured on Canopy Kingpin is related to price points. Canopy gazebos in particular, especially the hardtop garden models featured here, will cost you a pretty penny for sure. How can you go wrong with this? 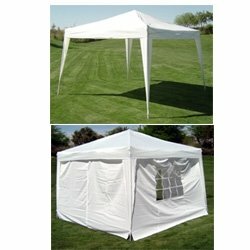 A full 10' x 10' pop up gazebo and it comes with a carrying bag too. Adjust the height with the telescopic legs and set up and tear down is a snap with the rust resistant powder coated pop up frame. The slant legs may look a bit flimsy but once everything is set up, the chord ties will keep the stability in check. Certainly a small inconvenience to deal with for the price of entry. This one is a tad smaller and is even cheaper than the first! 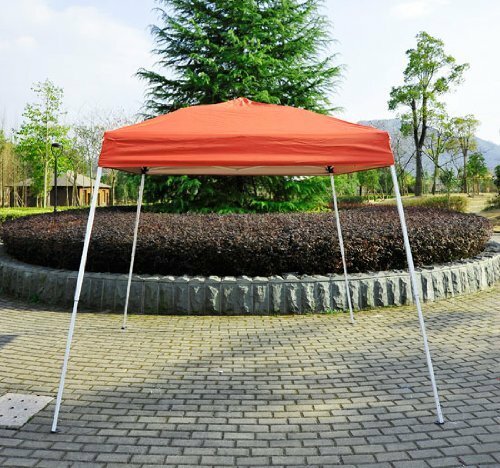 This rust red colored pop up gazebo is a steal. Certainly, a frugal beauty if the Kingpin ever saw one! Check it out and save some cash on this 8' x 8' model. The Kingpin knows that if you've reached this part of the post you're probably considering clicking through and buying a great pop up for yourself but just haven't made up your mind yet. "Are they really THAT portable?" or "is setting one up REALLY as easy as the Kingpin says?" 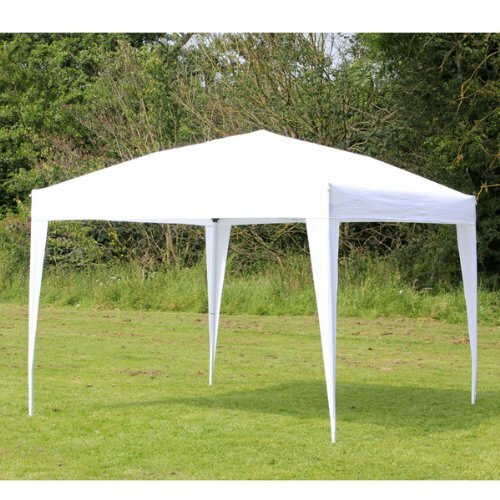 Just to put your mind at ease, the Kingpin has grabbed some short YouTube videos, just as documented proof that pop up gazebos are the ULTIMATE canopy as far as portability and ease of setup is concerned. If you have a backyard or have a penchant for going on outdoor trips, then you should consider owning one pop up gazebo or two. That way, you can be prepared for all sorts of weather, be it for a get-together in your own backyard, or when you are camping in your favorite outdoor area. What are pop up gazebos? Before we can properly explain, we should first find out what gazebos are in the first place. Traditionally, gazebos are structures that are used as a center for events in one’s own garden or backyard. They can be as bare as a circular structure of arches on which vines grow, and they can be enormous structures similar in construction to a greenhouse or a small cabin. 1) They are usually circular in form when looked at from above, though this can evolve to squares, pentagons, and hexagons, as defined by how many support posts the gazebo's canopy has. It is usually a solitary structure, separate from the main house, though some versions can have a covered walk leading to it. 2) They usually have open sides, though many models incorporate removable panels or heavy curtains, just in case protection from the outside environment or privacy is needed. 3) Although some gazebos do not have rooftops, most of them do, with the most costly ones using glass panels to let sunshine in. Because of the cost of building and maintaining gazebos, most of them were built only by the well-off – and this makes perfect sense, given that most of them also had the large garden that these structures required. The first big step in the evolution to the modern pop up gazebo was the ability to create collapsible metal structures that could be put up when necessary – in effect, what you had was a collapsible tent with an internal skeletal structure that could be folded away or dismantled. This design made more sense for those who had less material resources, had smaller gardens, or those who had no use for a permanent structure that had to be maintained all year-round. However, the next step in the development of the pop-up gazebo was also important: the addition of waterproof canopy material. This allowed portable gazebo structures to be as hardy against weather issues as traditional, fixed garden models. In fact, many portable gazebos also became similar to tents, such as pop up gazebos with sides. Roll-up fabric attached to the gazebo’s roof structure is rolled down to turn the gazebo itself into a rather large, upright tent. Of course, gazebo will always sound a little bit classier. The introduction of the pop up gazebo became a technological and practical change that spread across the social and cultural landscape (not to mention the actual landscapes of backyards themselves). People no longer had to keep their get-togethers indoors, and neither did they have to have the resources needed to build permanent structures in their yard. These products could turn a normal backyard into a nighttime party area, or a place for private meetings. One could even use a pop up gazebo with sides as a perfect additional area for guests if the inside of the house was proving to be too crowded. And for the more gentlemanly set, a gazebo tent could function as an open-air area where one could enjoy a cigar and some whiskey. The element of elegance and class for outdoor events had finally been removed from the hands of the well-off, and put in reach of anyone who could buy or rent a pop up gazebo. Now, even in this time when pop up gazebo tents are more common than actual traditional gazebo structures, buying one for personal use, or even renting one, can cost a pretty penny. Furthermore, size does matter in this case and the bigger the gazebo is, the costlier it becomes. When camping in the woods, create a central area where the whole camping group can do most of their social activities, before sleeping in their own tents – and if you have a pop up gazebo with sides, some people can use the portable gazebo itself as a sleeping space. A pop up gazebo is a covered floor space in an outside area. The possibilities are endless! This is the main reason why the idea of a portable gazebo is so appealing. A pop up gazebo can be used as protection against inclement weather - Aside from creating floor space in an external area of the property, a pop up gazebo provides protection against bad weather. This is particularly useful for light weather disruptions, such as a sudden downpour, or a light snowfall. This is why waterproof canopies for gazebos are the norm, as they can provide reasonable shelter from unforeseen bad weather. NOTE: this is one aspect where permanent gazebo structures probably are more effective. However, the argument to be made in this situation is that extreme weather would not encourage people to go through with an event, party, or get-together, anyway. It should also be noted that the pop up gazebo is also useful in terms of the dry season, where it can offer a shaded area against the harsh sunlight. Almost all of the items on this list are made with UV treated material and this is more important than most people think. Shaded areas can lower the ambient temperature by considerable degrees, giving you a great place to stay out of the heat and keep your cool. A pop up gazebo with sides that can be rolled down is by far the best option for those who live in areas where the weather can be unpredictable, though strong winds may necessitate the use of anchoring lines for larger, taller gazebo tents. Pop up gazebo tents can be taken to other locations – One big draw of using a portable gazebo pop up is in its very function: you can set it up anywhere. It can be as easy as deciding in which area of your backyard or front yard, or it can be used for large-scale camping groups, so that there is a central area where people can congregate and eat together before heading off to bed. When it is used in the context of camping, pop up gazebo with netting or breathable walls are the ones that are most useful, given their ability to be used as an activity area, and at the same time be a special central area that can be “walled off” from the outside environment, keeping out unwanted insects and bugs. Once you have made up your mind to acquire a pop up gazebo, you should also be aware that it requires maintenance, even if it is meant to be stored for occasional use. For example, pop ups with folding structures tend to produce small rips in the gazebo tent cloth after some time, and this can be a serious issue when it comes to weatherproofing. Depending on the waterproofing and the material itself, you may need to have special adhesives and patches to effect repairs. Maintenance of this kind becomes more complicated if your pop up gazebo has a visual pattern on its fabric. In most cases though, there are several canopy replacements available to buy if repair is not an option. The gazebo frame itself will also need maintenance, be it protection from rust, or, in the case of aluminum, care so that the straight pieces won’t be twisted or snapped in two by bad storage or incorrect assembly. To combat against rusting, almost all the metal frames featured on this list are powder-coated and treated for maximum protection. You should also consider the general number of people that your new pop up gazebo will be used for. If you're the type that tends to host family events, then you should have a larger model in mind, maybe one that won't mind uncle Carl dancing at the edge of the table after one too many margaritas. On the other hand, if you will be using it for more private get-togethers, then all you’ll need is the equivalent of a gazebo tent for a tea party. In all, if you are the type who prefers outdoor preparations for events and parties, a pop up gazebo is an indispensable part of your garden preparations. However, if your house has enough space for most of your parties, then it may be a good idea to simply rent one when needed, or to buy one that will keep well in storage, to be used on the occasions when you will have a larger gathering. The Kingpin hopes that some light has been shed on these awesome portable pop ups. If you're not dealing with terrible weather or extreme elements, instant gazebo pop ups will give you manageable shelter and coverage almost anywhere your heart takes you. 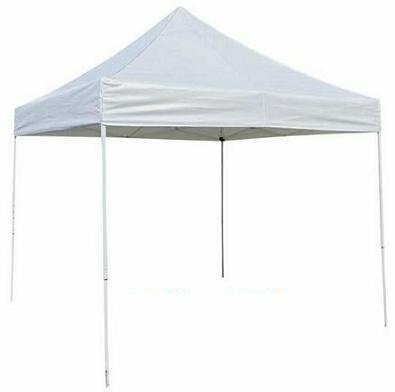 So, whether it's enjoying some quality time at the next family beach trip, or selling your homemade goodies at the farmer's market, or even band shirts and albums on the Warped Tour, a portable pop up gazebo may be just the thing for you!